As we discussed in the first article, the DLLs (due to ASLR) will be loaded at different memory addresses so we cannot use fixed memory addresses in our shellcode. But we can use this structure, found at a fixed memory address, in order to find the location of DLLs into memory. As you can see, some fields called “Reserved” are not described but some other fields are documented. For those unfamiliar with C/C++, you have to understand this: a BYTE means… a byte, a PVOID is a pointer (a memory address) – so it is 4 bytes on a x86 system (32 bit system) and PPEB_LDR_DATA is a pointer to a custom structure called PEB_LDR_DATA. There are two bytes reserved for the first field (because Reserved1 is an array of two BYTEs), the BeingDebugged flag is 1 byte followed by another byte (Reserved2). Reserved3 is an array with 2 pointers (so 2 * 4 bytes = 8 bytes) and Ldr is a pointer – 4 bytes. From this structure, we will use the Ldr pointer, witch we can find at offset 12 (or 0xC) within the structure (2 bytes Reserved1 + 1 byte BeingDebugged + 1 byte Reserved2 + 8 bytes Reserved3). We will act as before. We can access the InMemoryOrderModuleList field at offset 20 (0x14 in hex: 8 bytes Reserved1 + 3 * 4 bytes Reserved2). This field will give use information about loaded DLLs. The InMemoryOrderModuleList field is a pointer to a LIST_ENTRY field of a LDR_DATA_TABLE_ENTRY structure. It is NOT a pointer to the beginning of the LDR_DATA_TABLE_ENTRY structure, it is a pointer to the InMemoryOrderLinks field of the structure! As you can see, Flink and Blink are pointers to a LIST_ENTRY structure. At this moment we are placed on the InMemoryOrderLinks element of the first module loaded into memory. This module is the executable file (for example calc.exe). We want to navigate through all loaded DLLs. InMemoryOrderLinks, being a LIST_ENTRY structure – where first 4 bytes are the Flink pointer and the next 4 bytes are the Blink pointer, allows us to navigate to the second loaded module through the first 4 bytes. We need to do this one more time and we can access information about the third loaded module. As we discussed in the first article, we need access to kernel32.dll in order to access function like GetProcAddress and LoadLibrary that will help us to call any Windows API function. In order to finish our goal, we have to read the DllBase field (the memory location where the DLL is loaded into memory) from the current LDR_DATA_TABLE_ENTRY structure. The DllBase is stored at offset 0x18 in the structure, but we have to take care that we are already at the offset 0x8 (InMemoryOrderLinks field) so we just jump 0x10 bytes to get the DllBase. My Paint skills are not awesome, but I hope you can figure out how it works. Just remember that navigating through modules is done using the “Flink” pointer representing the first 4 bytes we are placed on. Do not be scared about this! As you will see, it is possible to do this in only 8 (more or less) lines of Assembly code. The Portable Executable is a file format used by executables and dynamic libraries (DLLs) on Windows system. The format describes the content of these files: the headers and sections containing all code and data used by PE files. There is plenty of documentation on the Internet, but here I want to describe you only the necessary information required to write a shellcode: the overview, headers, sections and the export table. The format is pretty complicated, but we just need to know how to parse the PE headers in order to get exported functions. You can find the complete structure and all other required structures within “WinNT.h” header files of C/C++ compilers. 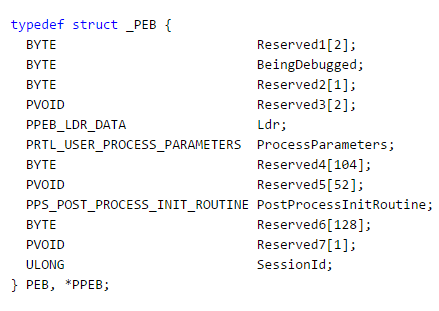 All PE files (EXE or DLL) will start with this structure. So, after we find a module in memory, at that memory address we will find this structure. You can recognize it by its first two bytes: “MZ“, this being the e_magic field representing the “signature” of the DOS header. The only thing we need to know is the e_lfanew field of the structure. This field is located at offset 0x3C and it shows us the location of the PE header. 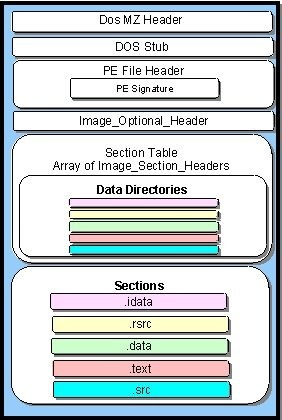 It contains the PE signature (you can see a “PE” string if you open a PE file with an editor), the FileHeader, a structure containing information like the number of sections (code and data), the “machine” type (x86, x64, ARM…) and “characteristics” determining among other information if the file is an executable (.exe) or a dynamic link library (.dll). The OptionalHeader is a structure containing more useful information for us. We are interested only on the last field, DataDirectory, because we need to get the exported functions. This is how a DLL works: it contains different functions and this functions are exported, so other application can just load the DLL into memory, find the exported functions and call them. As an example, “MessageBox” is an exported function from “user32.dll” (actually, there are two versions: ASCII and Unicode). 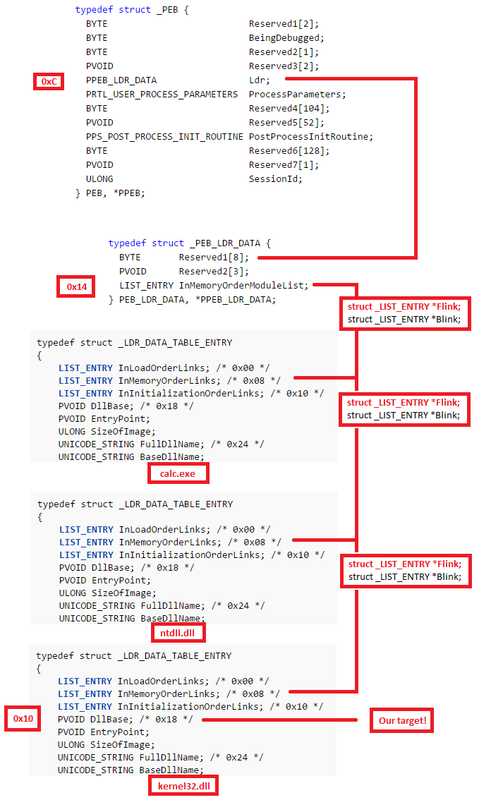 So at the end of the OptionalHeader structure there are IMAGE_DATA_DIRECTORY structures (16 actually). It is important for our scope to understand that the first one is the “export directory” data directory. In order to go to the export directory, we just need to follow the VirtualAddress field of the structure which point to the start of the export directory. A DWORD represents a type on 4 bytes and a WORD is just 2 bytes. If you will sum all the sizes of the elements until the DataDirectory array, you will notice that there are 120 bytes (0x78) bytes from the beginning of the PE header to the beginning of the DataDirectory array. So at offset 0x78 we will find the virtual address (VirtualAddress field) to the export directory. Let’s take as an example a DLL with three functions. AddressOfFunctions = 0x11223344 —-> [0x11111111, 0x22222222, 0x33333333] – The 0x11223344 is a pointer to an array containing the addresses of the functions: 0x11111111, 0x22222222 and 0x33333333 are the addresses of the functions. AddressOfNames = 0x12345678 —> [0xaaaaaaaa -> “func0”, 0xbbbbbbbb -> “func1”, 0xcccccccc -> “func2”] – The 0x12345678 is a pointer to an array of pointers to function names: 0xaaaaaaaa is a pointer to the “func1” string representing the exported function name and so on. AddressOfNameOrdinals = 0xabcdef —> [0x00, 0x01, 0x02] – The 0xabcdef is a pointer to an array of integers (on two bytes) representing the offsets of each function in the AddressOfFunctions array. In order to get a function address by its name, we check the names by parsing the AddressOfNames array. First function (func0) will have the ordinal 0, second function (func1) will have the ordinal 1 and third function (func2) will have the ordinal 2. So if we are searching for the func2 function, we will access the element 2 (starting from 0) of the AddressOfFunctions array. Shortly, it is like this: function_address=AddressOfFunctions[ Ordinal(function_name) ]. Don’t be scared about this, as you will see, it is possible to do all this stuff in about 15-20 lines of assembly code. Even if it is possible to write shellcode in C/C++ as you can see in this article, if you want to properly understand what is does, how it works and how can you modify it, you should be able to understand and write assembly code. In this section I will provide only a few basics on the assembly language, please do not rely on this section and read a good article such as this one in order to properly understand ASM. The descriptions within this post will not be complete, I just want to cover some common operations in order to be able to write a simple shellcode. In order to avoid different complications, I will write all the examples below using inline assembler on the Microsoft Visual C++ Express Edition compiler. However, you may find more convenient to use an assembler such as MASM, NASM or YASM. Let’s start with the “variables”. The processor uses different registers (think about them as variables) in order to store temporary data. They have different purposes, but here we will treat them as “global variables”. For a better description you can read this article. Let’s say the execution of our program starts at address 0x12345678. There is a special register that holds the current address of execution called EIP (Instruction Pointer). After executing an instruction, this register will be automatically changed to the address of the next instruction. Ok, now that we have “variables”, let’s see what can we do with them. There are multiple instructions we can use in order to do something useful. It is possible to place a breakpoint, a point where the Visual C++ debugger will stop, by clicking the left grey line. When you will start the program it will stop at the specified breakpoint. Now, on bottom you will see a “Watch1” window. That is the place where you can add the register names in order too see their values. So add EAX, EBX and so on and watch them. You can press F11 to execute the instructions one by one and you will see in the watches window, how the value was modified. Oh, or you can just keep the mouse pointer over the register names in order to see their values. Just note that this is very basic, you can use a debugger like Immunity Debugger for an advanced functionality, but to keep it simple you can just use this one. The control flow of the program will pass through some decision sequences, to compare two values in order to take different actions. First of all, you need to know that you can use labels. As you will see, labels are just “names” for different locations of code. And you can use “jumps” to reach them. jnz address/label – The opposite of jz (jnz = Jump if Not Zero), the code will jump to the specified address if the Zero Flag was not set, so if the cmp instruction operands where different. We can go now to an important part of ASM programming: the stack. The stack is a place in memory where you can store data. Think about it as a memory space where you can put data like you can put plates, one above each other and you can get them only from the top. If we get data from the stack, everything happens the other way: the data is removed from the stack (actually, it is still there, for optimizations) and the ESP value is increased with 4 bytes. Thinking about the maths of the stack, we can assume that if we put 0x20 bytes on the stack (by using 8 push instructions, 0x20 = 32) we can easily clean the stack by just modifying the ESP value: add ESP, 0x20. This is easier than 8 pop instructions. We can now call functions. 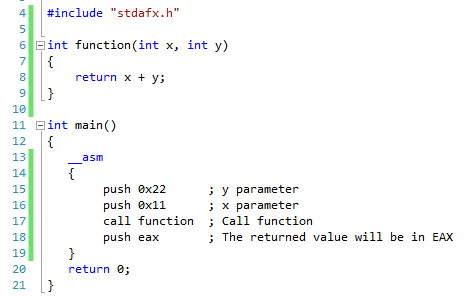 There are two very common methods to call functions, called stdcall and cdecl. The Windows API uses stdcall calling convention (method) and we will discuss only this one. However, they are similar, you can find more information here. 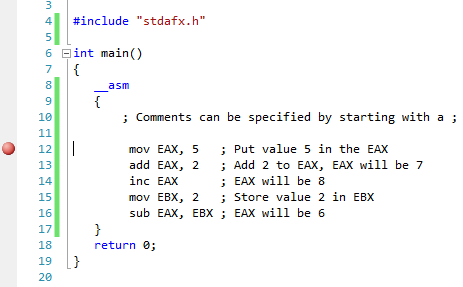 So after the execution of this function we will have the 0x33 (0x11 + 0x22 = 0x33) value on the EAX register. lea destination, source (Load Effective Address) – Is used to put into the destination, the memory address specified by the source. ASM is a difficult language but if you take it step by step it is easy to understand it. Even if we didn’t write any shellcode yet, we learned all the required information in order to be able to write a shellcode. We learned what is PEB and how can it help us, how a PE file looks like and even to write a few basic lines of ASM code. In the next section we will actually write a shellcode, we will do something useful with the information gathered from this article and from the first part. As you will see, we will just apply the techniques learned here.